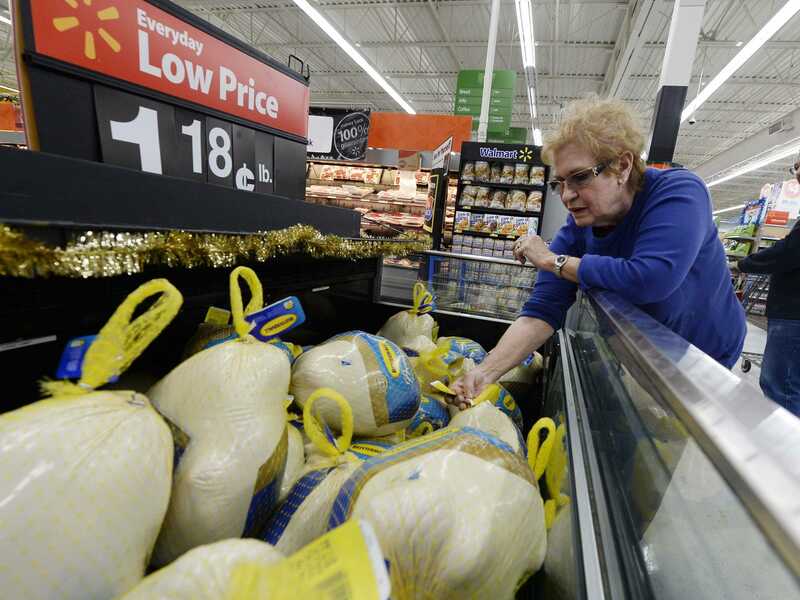 REUTERS/Kevork DjansezianA customer shops for turkey at a Walmart store. The average Thanksgiving Day dinner this year will cost $US49.41, according to the American Farm Bureau Federation. Each year, the American Farm Bureau Federation estimates the cost of Thanksgiving around the country based on feeding 10 people a meal with a 16-pound turkey, bread stuffing, sweet potatoes, rolls with butter, peas, cranberries, carrots, celery, pumpkin pie with whipped cream, and coffee with milk. The average costs has hovered around $US49 since 2011, and results were based on 179 volunteer shoppers checking prices at grocery stores in 35 states. But what would the same dinner have cost a century ago? The Morris County Library in New Jersey researched the advertised prices of common Thanksgiving goods from November 18-22, 1911 in the NJ newspaper, The Daily Record. They discovered the cost of everything from sweet potatoes to plum pudding on the newspaper’s old microfilm, and shared it with Business Insider. Of course, these prices don’t take inflation into account: That measly sounding $US6.81 suddenly jumps to a staggering $US167.77 when you consider inflation (calculated here for 2013 prices). 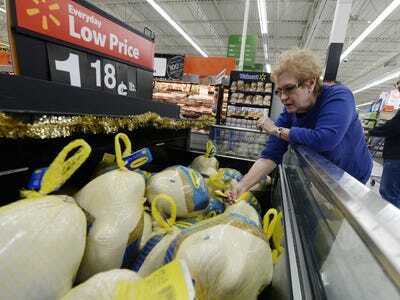 It’s mostly due to the sheer size of the turkey since a 16-pounder in 1911 prices would cost roughly $US110 today (this year, that same-sized turkey will cost Americans $US21.65, according to the American Farm Bureau Federation). See the full list of prices from New Jersey in 1911 over at the Morris County Library website, and be thankful that your turkey this year didn’t cost over $US100.